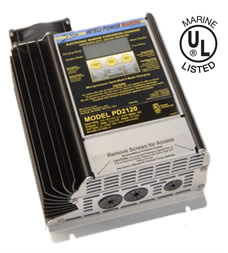 The PD2120 is a 20-amp Electronic Marine Converter/Charger capable of charging up to three separate banks of batteries at the same time. It incorporates a microprocessor that constantly monitors battery voltage, then automatically selects one of four operating modes to ensure safe, rapid recharging cycles. The Storage Mode and the Equalize Mode of operation ensures minimum battery gassing and water loss while preventing battery stratification and sulfation. All Inteli-Power chargers are designed to meet the stringent requirements of the Marine environment and are UL listed for safety. A digital meter displays current, voltage, operation mode, blown fuse indication, and battery type. patented Microprocessor constantly monitors battery voltage and automatically selects one of the four charging modes; BOOST, NORMAL, STORAGE or EQUALIZE. allows the converter/charger to charge three separate banks of batteries. Each output is capable of handling the full rated current of the charger. prevents converter/charger from being damaged if the batteries are accidentally connected to the charger in reverse. prevents high voltage spikes from damaging the converter/charger. limits the output current to the maximum rating of the charger to prevent overheating and damage caused by shorts or excessive loads. only runs as fast as required to maintain a more constant operating temperature inside the converter/charger. This feature reduces thermal stress caused by fans that cycle on and off. to provide optimum charging profiles for lead-acid, gel-cell, or AGM batteries. prevents AC Line voltage variations from being transmitted to the batteries and 12 volt circuits. prevents converter/charger damage in the event the fan is unable to cool the charger due to inadequate compartment ventilation. Inteli-Power Converter/Chargers can be connected in series to provide a combination 12/24 Volt system, or in parallel to provide more current.